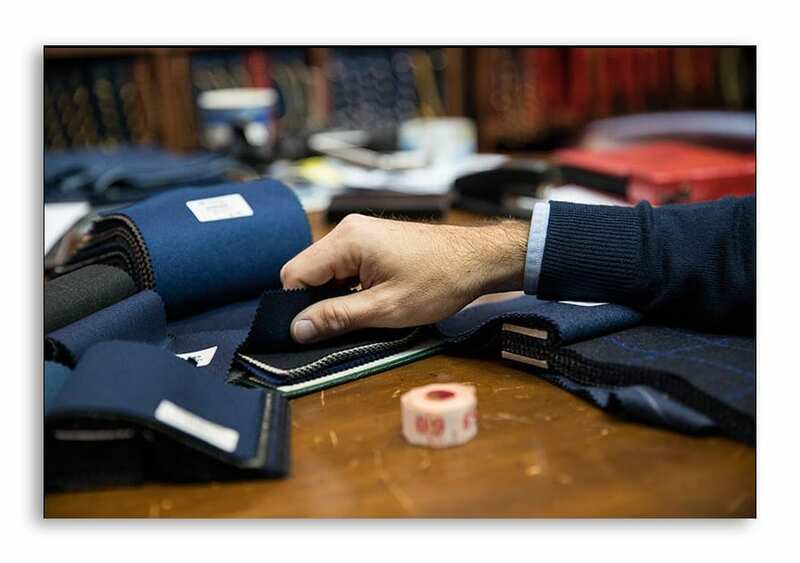 From the moment the client makes the ultimate decision to acquire a bespoke suit at Universal TAILOR, he commits to three separate visits before taking delivery of the hand-crafted masterpiece. At Universal Tailors, the first step is to have a chat with the client in order to establish their needs and personal expectations. This may include their work and background or the circumstances in which they will primarily be wearing their suit. It helps us to narrow down the selection of fabric swatches to show to the customer from the hundreds that are available. The final choice is of course down to the individual, but we try and guide them towards something suitable that we know is likely to meet their needs. The next step is to select the style; one or two-button front, single or double breasted, the number of buttons on the cuff, the width and style of lapel; there are certain subtleties. This is where bespoke makes all the difference as there is no limit to what we can do for you. For example; additional pockets inside the jacket to carry ammunition or tablet. We will then examine the client’s configuration and are accomplished in taking into account such features as a dropped shoulder, hollow back, one arm longer than the other, a prominent chest or a stoop; each client will be defined by their individual qualities & characteristics. These measurements, the style and subtle observations that accompany them, are then transferred onto an individual paper pattern that is unique to each customer. The patterns are retained on file indefinitely and adjusted from time to time as necessary, to reflect the customer’s changing shape and style preferences. One shirt would be completely ready at this stage and one trouser would be ready for fitting but the trousers wouldn’t be hemmed, and the waistband won’t be attached at this level. The jacket would be “baste” together. This basically means that the basic parts of the jacket are sewn together. Simply using a simple, white cotton “basting thread”. Using only the minimal interior construction, canvas and shoulder pads/wadding etc. This enables the cutter to check the basic fit of your pattern, and also allows more chances for later alteration, should he need to correct any major errors in the pattern. The basted suit is a blueprint or ‘first draft’ of the final version and can be radically altered if necessary. The cutter will make notes and usually chalk several marks on the jacket to instruct the tailors on how the suit is to be altered. 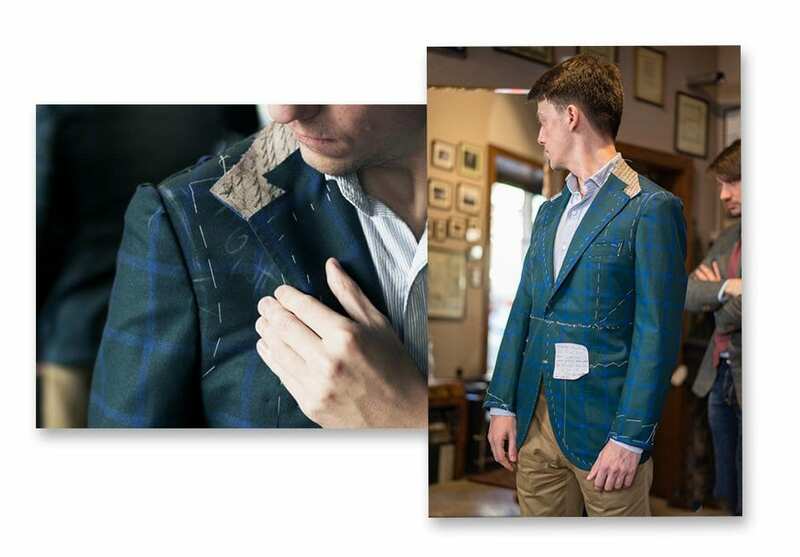 The fact that the suit is only basted together changes like lengthening or shortening the jacket or to raise or lower the buttoning position can be easily done. These options would not be possible on a made to measure or semi-bespoke suit. Following this, the garment will be ‘ripped down’ which as the term suggests, is the process by which the suit is taken apart and re-cut, based on the observations, chalk marks and pins put in by the tailor. At this stage your paper pattern is also updated so we can accurately recreate the fit for your future purchases. Once this has happened under the scrutiny of the master tailor, it is sent to the coat maker to then assemble it to the ‘pocket baste’ stage. Pocket baste’ is the next stage of construction and from this point on, the suit begins to look a whole lot more structured. 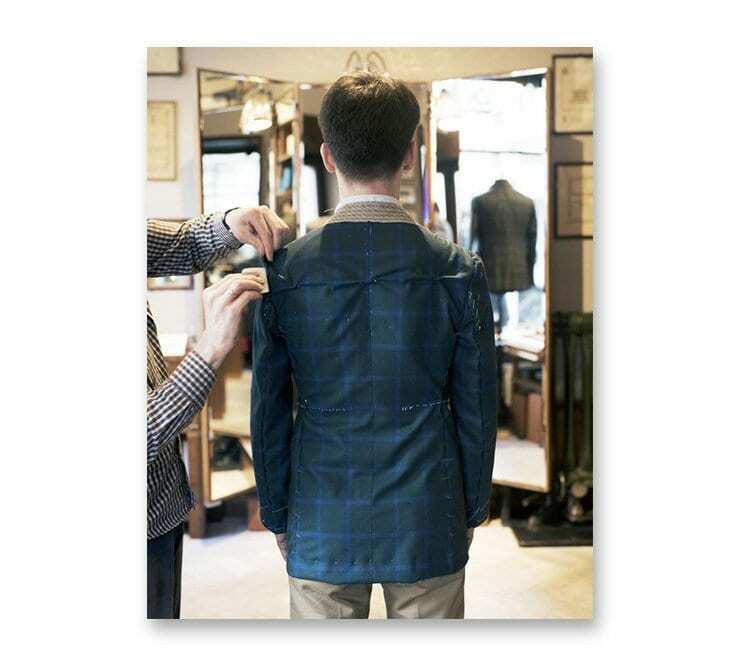 The coat maker will have hand-padded the chest and lapels, and put the outer pockets in and at this point, the customer will be invited for the second fitting called “forward fitting’. This stage allows for lapel facings to have been added and the lining will be basted in place. The collar will not be fitted and the sleeves will be the at the same stage as the skeleton baste. Again, this will give the truer picture of how your suit will look. Again, any alterations needed are made to the suit and pattern. All the trousers and shirt would be ready at this stage. This is the final stage before it goes to the finisher where the lining will be filled-in and the buttonholes finished off. So we arrive now at the final fitting. The garment is finished, all the handwork is completed, the workmanship will have been inspected repeatedly and as long as it looks perfect when the customer tries it on, the client can take it home. Even at this late stage, however, it is always possible that a minor alteration or adjustment may deem necessary, we will go ahead and do it. After this is completed, we will have the suit steam pressed and have it packed in our nice suit bag ready for pick up. We always have the paper pattern store in our factory to replicate any future orders.